I have always been fascinated with eggs. A fascination, I believe, that stems from both their beautiful exterior to the mystery and wonder held within. While their shape and general purpose unify them across the animal kingdom, I love the unique sizes, colors and patterns that are influenced by species. 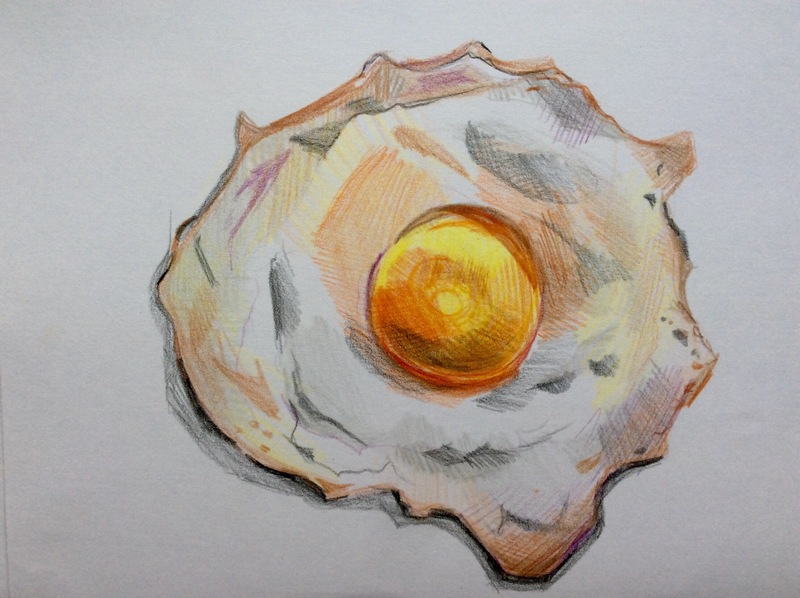 While in the future I would like to create art focused on the exterior of eggs, today’s drawing is of what you would typically find on your breakfast plate. Having been watching a lot of cooking shows lately, I thought it would be fun to do some food drawings. When picking an “entree,” I decided that an egg (sunny-side up) would be both artistically challenging as well as visually pleasing. I knew that while the pleasant factor would be found in the bright, spherical center, the challenge would lie in depicting the egg “white.” As any visual artist knows, white is never just white, and the fun lies in attempting to pick out the colors within. This drawing is rendered in colored pencil, which lends itself well to layering and creating depth through color, and took about an hour from start to finish. There is always something satisfying about drawing food, especially food that is visually playful. Stay tuned for my newest ice cream-inspired piece, but in the mean time, be sure to check this out!